Johannesburg : South African super star Bonang Matheba is considering taking action against Kaizer Chiefs shot stopper Itumeleng Khune after an incident in which Khune rubbed her inner thigh and kissed her at a night club in Sandton last weekend. Sources state that Queen B remains furious at how the Bafana Bafana and Kaizer Chiefs shot stopper behaved. A South African publication states that Bonang’s management wants to get to the bottom of this matter before considering legal options. The drama began when Khune saw Bonang and Somizi Mhlongo in the night club’s VIP section. Khune greeted them while greeting Bonang he allegedly put his hand up her dress and kissed her. 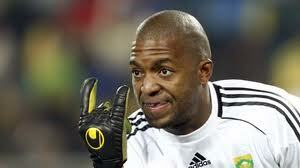 Itumeleng Khune is in an on- again, off relationship with TV personality Minnie Dlamini who was once a co- host to Bonang Matheba in a TV programme.